Bronchi (one Bronchus) are the large air tubes leading from the trachea to the lungs. They carry air to the lungs. The trachea (windpipe) divides to form the right and left main bronchi. These divide to form smaller and smaller tubes called bronchioles. 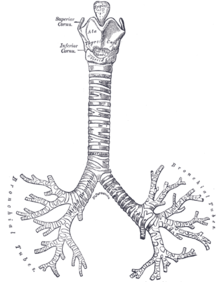 Eventually the bronchioles end in the alveoli (small air sacs). At the alveoli, oxygen from the air we breathe into our lungs is moved into the blood. The blood then carries oxygen around to the rest of the body, which needs oxygen to survive. Without the bronchi, air would never get into the lungs, and oxygen would never get into our bodies. The bronchi's walls are made of cartilage. The right bronchus (shown on the left in the image on this page) is shorter, wider, and straighter than the left bronchus. This page was last changed on 30 January 2018, at 08:03.